From the comfort of your suite, you step to the veranda and watch the sun glitter over what seems to be snow caps on the Great Barrier Reef. You take another sip of coffee, anxious to board the skiff and be taken away. Time passes, anticipation builds. "Welcome aboard," chimes your guide. The intensity peaks. Minutes later you're there. A rush flows through you with the anticipation of an unforgettable dive. With a splash, the next thing you see is 60 feet of aquamarine sunlight piercing down the edge of a coral wall. You mellow in its calmness, and you know you're home again. The Great Barrier Reef of Belize is more magnificent than you pictured it. Without a doubt, you've just checked into The Grand Colony Island Villas. You are pampered as royalty above and below the surface. 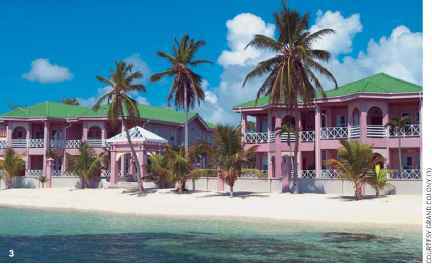 This presidential- suites hotel features two- and three-bedroom suites on 600 feet of imperial Belize sea front. Grand Colony has 21 2,000-square-foot palatial living spaces and an ocean as far as you can see. Surrounded by unprecedented quality and comfort, your suite becomes a sanctuary of divine living. Your new home is away from the crowd and set on peaceful Caribbean sand, one mile south of busy San Pedro on Ambergris Caye. Overcome with tranquility as you gaze across the plush courtyard that leads to the beach, a Ble-tia Purpurea orchid catches your eye. You enjoy the spacious feeling of the 100-foot pool belonging only to you. Reclined in a lounge chair with closed eyes, your mind echoes the thrill of this morning's dive. As the sun sets you meander to the veranda, holding an icy Elderberry Martini and thinking of tomorrow morning's dive. A romantic stroll down the beach leads to Rico's Bar and Grill. The maitre d' shows you to a private table on the deck. As you sit under a canopy of stars, you appreciate a sparkling Moet followed by a fresh grilled lobster. A perfect day has passed; another will follow. Grand Colony and its sister resort, The Villas at Banyan Bay, are situated adjacently and present more than 1,200 feet of premier beachfront to their guests. Enjoy the inimitable while you dive, snorkel, fish and tour the adventure of Belize.